For your Rave account, you have different balances nominated in the different currencies we settle in. The funds in your Rave balance can either be automatically settled to your bank account, or used for transfers. The Balance page on your dashboard shows the amounts you have in both the ledger balance and available balance for all the currencies we settle in. What is my ledger balance? Your ledger balance is how much you have received to your Rave account. 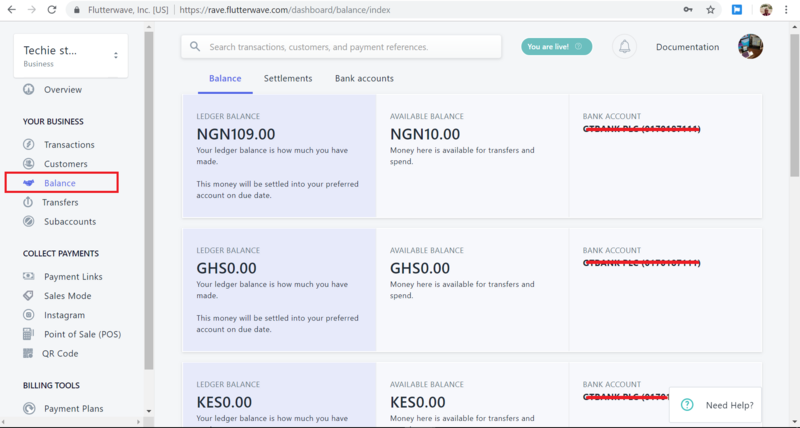 Depending on how your account is set up, the money in your ledger balance will either be settled into your bank account (by default) or stored in your available balance for you to use for transfers to whoever you wish. Your available balance is the money available to you for transfer purpose. You can either send this money to your own bank account or to any bank account in any of the countries we support. I should also mention that there's a fee attached to each transfer depending on the currency. Please see this link to find out how to make transfers to bank accounts.